The last time that I checked my credit score was in February when I almost didn’t have any borrowed money from credit cards. When I saw my FICO score from Experian at 769, it was really a pleasant surprise because it was the highest score I have ever had. Racked up nearly $100,000 in credit card balance from credit card arbitrage. From what I have heard, these activities, opening too many cards in a short period of time and carrying very high balance, could have very negative impact on credit scores. But how bad could be it? 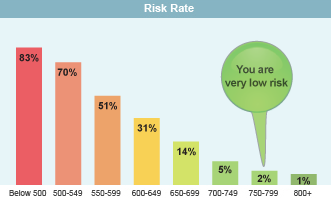 The last time when I also used more than 30% of my overall credit limit, my credit score was 699. Now, the utilization ratio is nearly at 50%. Could it be even below 699 that I got more than a year ago? Not only that the score didn’t drop as I expected, it actually added nearly 20 points in 6 months! Surprise, surprise, surprise. To make sure that this score reflected the activities I mentioned above, I checked the total balance of my accounts, which showed indeed that I have nearly $100K balance as of now. According to myFICO, the amount owed should account for 30% of the credit score, but it doesn’t seem to have too much negative impact in my case, comparing to what I had half a year ago. Of course, there’s always the possibility that my score could be even higher (maybe over 800) if there were no such a large balance. From what I saw the only negative item on the credit report is that I have too many credit accounts with balance (7 out of 41). I have heard lots of talks on credit cards and credit score against having too many cards, opening multiple accounts in a short period of time, or carrying a high balance. While the advices are valid in general, it doesn’t appear I am being punished for doing exactly that. Could it be that the negative impacts of these activities are overstated? I don’t know, but it’s possible from my experience. My credit history isn’t very long (less than ten years, but still quite long to get where I am now), and I own 41 credit accounts (including those closed). That’s an average of more than 4 cards ever year. Even now I am still on the look out for good deals to make a few bucks. Looking back the past decade, the only thing I did that contributes significantly to my current credit score is I never had a single late payment. I always pay in full every month, no matter how big the balances are, while trying to charge everything with credit cards. So far I haven’t got into a situation that I had to charge on credit cards, but couldn’t pay it back. For whatever I charge on the plastics, I make sure I have the ability to it in full on time. After all, what I feel is when creditors evaluate my credit-worthiness, their main focus will be on my payment history, not the number of accounts I have. I can have dozens of cards (and I do), but as long as I pay each and every card on time, I don’t necessarily pose higher risk than people have only a couple of cards. BTW, for the credit limit reallocation question, I don’t think it’s an issue. On one Chase card, I have a credit limit of only $500 after moving the line to the Freedom card and the highest balance of $11,000. But no negative record. Hmm…. This is quite interesting. I actually have never purchased a fico score report so maybe I should do so one day. I have gotten those free reports though. That is quite amazing, $100,000 in CC arbitrage. I am jealous! Must take a lot of management, no? Congrats either way, that extra $400 a month must be quite nice! This is a great post, we have cited it as one of our favorites in our Sunday Review #33. Could not get your trackback to work, was repeatedly giving errors for the given URL. Credit card arbitrage is a game. You are gambling that life won’t hit you upside the head causing you to be unable to make the payments. If you want extra money just invest your money in an Income Fund that pays a monthly or quarterly dividend. Then,if life smacks you upside the mullet,you will not be worrying about making a large credit card payment. Credit card arbitrage does not take risk into account. Keep a lot of cash on hand if you are going to play this game. redtoblack: Yes, it’s a game, but it doesn’t necessarily mean I will fail. All the money I borrowed were deposited in a bank account that I don’t want to spend on anything but earning me interests. If I have to pay it back, I can pay off all the balances without any problem. The only “risk” in credit card arbitrage is late payment. So far I have managed that pretty well, no single late payment ever since I started playing the game. If I can pay my credit card balances in full every month, I don’t any extra risk from credit card arbitrage. Of course, if one can’t resist the temptation of spending the “free money,” that’s not the game he/she wants to play.